PE9862/NF-10 standard gain horn antenna (also known as a waveguide horn antenna) is part of our huge selection of waveguide antennas. 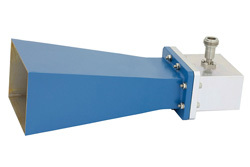 Pasternack standard gain horn antenna is manufactured with a WR-229 input and a waveguide to coaxial transition adapter. Our WR-229 standard gain horn antenna has a waveguide to coax adapter transition with a N connector input that is female gender. WR-229 standard gain horn waveguide antenna with N input has a minimum frequency of 3.3 GHz and a maximum frequency of 4.9 GHz. Pasternack PE9862/NF-10 WR-229 waveguide horn standard gain antenna is rated at a nominal 10 dB gain. Our 10 dB standard gain horn WR-229 waveguide antenna with N adapter has a vertical beam width of 51.9 and horizontal of 58.6 degrees at 3 dB.